Gizmondo 2 will get a redesign, launching as a gaming-friendly smartphone in 2009. Or will it? 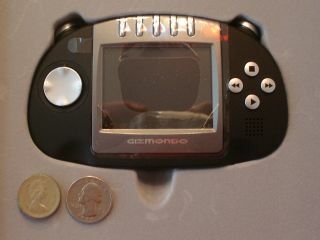 Hardly a surprise to hear, but it looks like Gizmondo 2 is going to miss its mooted release in 2008, with the return of the much-maligned handheld console now skidding and crashing into 2009. Gizmondo creator Carl Freer informed Swedish blogger Hans Sandberg that the credit crunch "has affected us in our ability to fund and get funded in regards to the manufacturing of components." "I was at one point thinking of abandoning the whole project," explained Freer, as our hearts skipped a beat! "I didn't see a way out of it; a way to fund it." However the Gizmondo mark 2 is still penned in for a 2009 release, with a Windows CE and an Android model promised. As T3 notes: "So instead of taking on the likes of Sony and Nintendo, Gizmondo 2 will be just tackling HTC, Nokia, Samsung, Sony Ericsson, BlackBerry, Palm and Apple." Freer describes Gizmondo 2 as "a fully wireless Pocket PC, one that also has a gaming engine… There is nothing out there in the market that has the open-source App Store compatibility that we are talking about." It is a nice idea, but after all the kerfuffle over the original you'd be forgiven for being pessemistic about the chances of this making it to market.